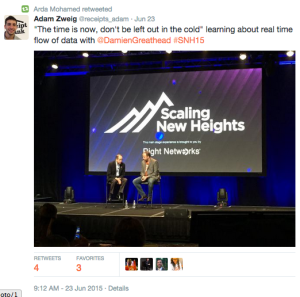 Last month’s Scaling New Heights conference was held in the historic and captivating city of New Orleans. The four-day event was filled with informative sessions that were geared towards training QuickBooks ProAdvisors to leverage the latest thought leadership, technology and training. Led by industry experts, the conference stressed the importance of adopting new cloud accounting technologies in order to run the most effective, efficient and forward thinking practice they can. It was exciting to see the level of enthusiasm all attendees displayed for modern accounting practices and how readily they recognized Receipt Bank as a vital tool in achieving that transition! Reinforcing the significance of adapting and embracing the rapidly changing accounting landscape, Joe Woodard’s keynote address analyzed the components needed to become a #FirmOfTheFuture. So, how do you become a #FirmOfTheFuture? Firstly, begin by abandoning the traditional accounting model which is reactive in nature. Next, start to leverage cloud based technologies that will give you access to factual, real-time data. From there, utilize that new level of insight to become a trusted advisor to your client. The keynote speech from Luis Sanchez, the global QuickBooks ProAdvisor Program Director, revolved around partnership. 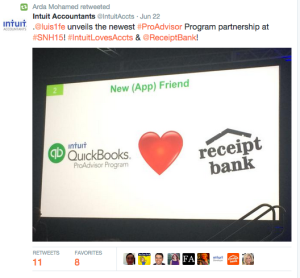 This went hand in hand with his huge announcement - the exciting new QuickBooks ProAdvisor Partnership with Receipt Bank! The next morning’s general session featured a discussion between Joe Woodard and Receipt Bank’s Damien Greathead - where the overarching theme of the day was moving the role of the accountant and bookkeeper from scorekeeper to coach. Taking advantage of the cloud is an integral step in process automation and maximizing productivity. This message went hand in hand with what we here at Receipt Bank want to offer you - a way to modernize your practice by moving away from data entry towards data management and analysis. As always, it was a pleasure to meet so many of our partners and hear encouraging stories of how cloud accounting is dramatically improving their practices’ productivity and growth. It was also exciting to meet the many new ProAdvisors who recognized Receipt Bank as an integral part of becoming a #QBFirmOfTheFuture. Congratulations to the Top 100 ProAdvisors for their diligent work in becoming a “Firm of the Future”! We are thrilled to welcome aboard all the QuickBooks ProAdvisors who are looking to streamline their current processes and save time to offer higher valued advisory services to their clients. Thanks so much to Joe Woodard and his team for putting on a great event. we're already looking forward to Scaling New Heights in 2016. Find out more about the Quickbooks ProAdvisor Partnership with Receipt Bank.